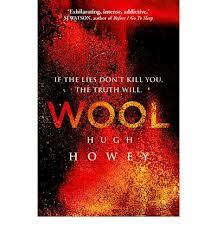 Wool by Hugh Howey is a thoroughly intriguing read! I loved it, and read it in two days, luckily it was weekend, so had some reading time to devote to it. The story behind the author and the book is here. Please read it, interesting and though provoking, especially if you have read the novel. If not, Do! If I had known it was classified as ‘sci fi’ I probably wouldn’t of picked it up, but it is way more than ‘sci fi’, it is a post apocalyptic novel with echos of our present and truly unputdownable. My words will not be able to do it justice. Suffice to say, the next instalment is due out soon and looks like even a movie in the future! One, I have to admit to wanting to watch if and when it does! Are you as taken with it as I am or not really?